Water apples are known by many names. We call it wax jambu in my household. I love cooking with fruits and had a little kitchen fun experimenting with water apples when a friend gave some to us. Water apples aren't as sweet as most fruits but it is juicy so it makes more sense to stir fry it than to attempt baking it with something. Anyway, here's what I did. Simple, but the outcome was tasty. My other half, the one person who has little love for this fruit has this to say ~ "I never knew water apples could taste this good!" I agree. Estimates for two, best eaten with rice. 1. Heat oil in cooking pan. Add garlic and fry until lightly browned. 2. 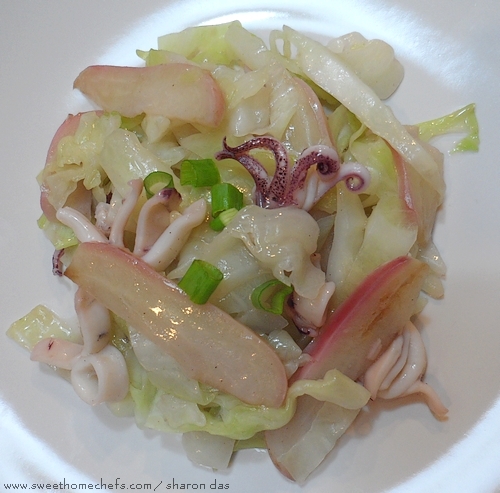 Add squid, water apples and cabbage. Season with salt and pepper. 3. Stir fry until water apples are slightly tender. Finish by stirring corn flour into the mix. 4. Garnish with spring onion before serving.